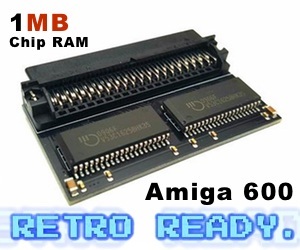 If you want to treat yours or someones Amiga 500 or Amiga 600. Then head straight over to www.apollo-accelerators.com and sign up. It might take a while before it will arrive, however it is the thought that matters, isn’t it? When it arrives, the lucky one will have a very fast Amiga with 24bit Graphics Card HDMI output, 128MB RAM and a MicroSD slot. This is the ultimate Christmas present for all who wants to give AmigaOS a bright future. At a prise of just 109 EURO at Amedia Computer, this is one of the more affordable Amiga Christmas presents this year. It’s also a very good gift for users with slower 68k CPUs as Prisma will play MP3’s, OGG’s and other formats without any CPU load from the Amiga. With this soundcard, your Amiga becomes the beat in the house or the lucky one getting it under the Christmas tree will be very happy for sure. 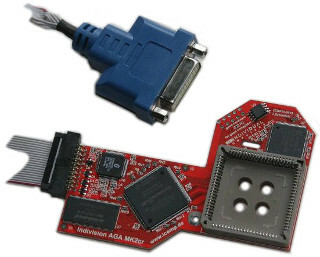 Prisma Megamix card works fine in Amiga 1200, Amiga 1500, Amiga 2000, Amiga 3000 and Amiga 4000! This product is also out Now! 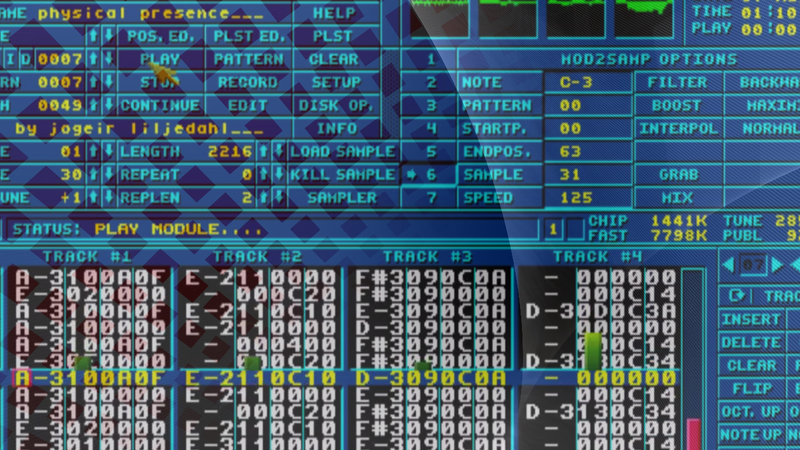 This is a very nice treat for your Amiga 3000, Amiga 3000T, Amiga 4000 or Amiga 4000T. It gives these nice Amigas, 128MB or 256MB SDRAM Memory Expansion. And if your totally up for it. You can give your Classic Amiga 2GB of RAM if your into it, but that needs some modifications here and there. You get this for 78 EURO at Amigakit Amiga Webstore. 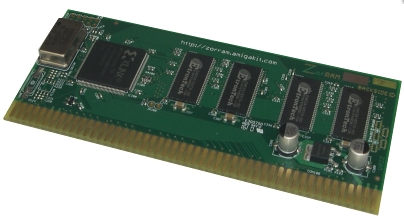 Board plugs into any free Zorro III expansion slot and auto-configures the memory for use as Fast Memory. Compatible with AmigaOS 2.0 to AmigaOS 3.9. Also AmigaOS 4.1 Classic is Supported! Not available right now, but possible to buy. Nice Christmas present anyway for sure! Works with Mediator 4000Di and Mediator 4000D. At a price of 1799 EURO, this is a special Christmas tip and Amedia Computer give you a great price for this product from A-EON. If you know a Amiga user that deserve this, then she or he would be very happy to get one. Also don’t forget to get a nice casing. This product is also availble Now! For now only AmigaOS 4.1 runs on it, but in the very distant future also MorphOS 3.10 will support it! AmigaOS 4.1 electronic licence included ! For 149 EURO you can give a Amiga user a much better life for sure! Or you can give it to a Amiga user that almost have quit because he’s tired of finding monitors and tvs that supports Amiga video signals. With this card that you can get from Vesalia, you have a DVI out that is compatible with most of todays monitors and also tv’s. With this card, you can also push your AGA Amiga to actually show 1366×768 on your HDTV. Also PAL and NTSC signals gets thru without any issues. This is a Christmas gift that is as important as Vampire FPGA, because it makes the Amiga useable again! This product is also a nice one for those Retro users that actually loves the AGA output for Amiga. 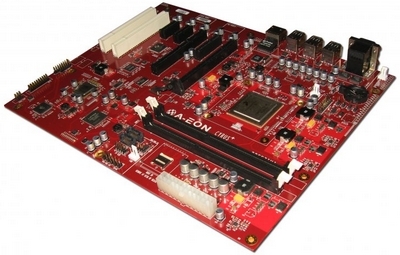 There is also a Indivision ECS, that is a bit older with only VGA output also. 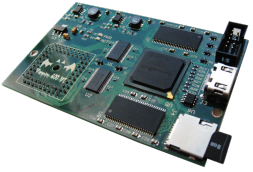 These products have also been tested working together with Vampire for Amiga 600. A very nice gift for sure and a very solid product that Distrita DA uses everyday at their offices also! At Amedia Computer you can get yourself a game treat for 38.9 EURO or give it to someone claiming that todays games are to easy. Reshoot is for sure a hard game, but the graphics and the music is really addictive. You only got one life, but the atmosphere intens. Why does games need to be so easy these days, when Reshoot can be bought and give yourself progress for each time. 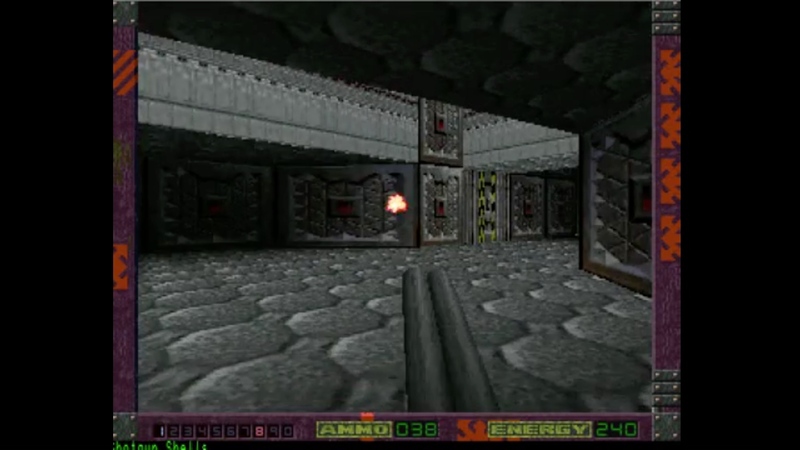 Reshoot is a shooter that is scrolling smooth and enemies are 3D rendred like in Super Stardust. 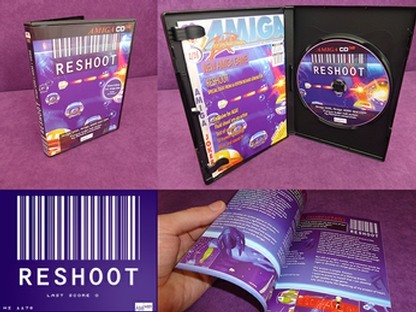 To be able to play Reshoot you need a AGA Amiga or a Amiga CD32 game console. 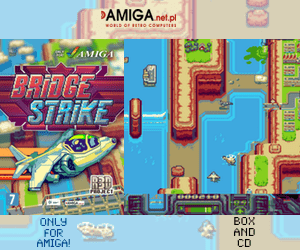 AMIworx have made lots of Amiga spirit in this game and it is fully bootable from an Amiga CD32! Also supports Amiga CD32 gamepad without any issues. If you just want to give a nice Christmas present or buy it so that the developers can get a nicer Christmas themself. Buy it today. It’s available today. Amiga market is in better shape than ever. It is very active and these products are just some of the products that is nice to mention. 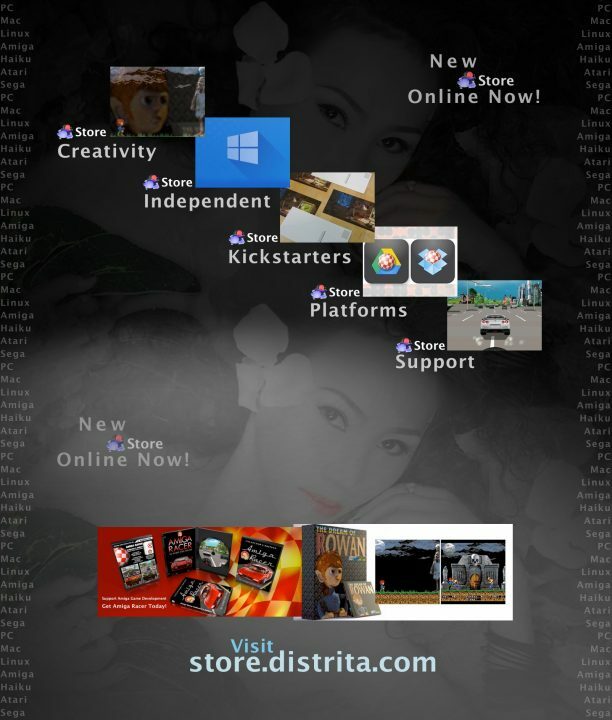 If you also go to Distrita Store, there you can get yourself Amiga postcards, Pre-order The Dream Of Rowan or just Buy yourself a copy of Amiga Racer. Also, when you use Distrita Store, 3% of all income goes to Distrita Support Account that will benefit someone twice in 2017! Have a Merry Christmas and a Happy New Year. Amitopia wishes all Amiga users the best and hope that you check out our site daily… And don’t forget to share and like us on Social Media. Amitopia support depends on your help. If you just want to give a Christmas gift to use, you can also donate thru our PayPal on the right sidebar. Thanks for supporting Amiga and have an awesome holiday. But don’t worry, Amitopia will be updated now and then even Christmas is here. Viva Amiga! The computer for visionaries and dreamers!